IT Healthcare Company, Eloquence Communications, Conquers the Language Barrier Between Medical Facilities and Patients | Company Newsroom of Eloquence Communications, Inc.
Ann Arbor, Michigan, January 19, 2017	(Newswire.com) - ​​​As the U.S. grows more culturally diverse, some healthcare experts worry that patients are suffering adverse events due to the lack of professional interpreter and translator service availability and poor usability when such services are available. Instead, Limited English Proficiency (LEP) patients frequently rely on nonprofessionals, including family members, who lack the understanding of medical terminology. This increases the risk of medication errors, incorrect procedures, avoidable readmissions, untreated pain and discomfort, and other adverse events. According to the Agency for Healthcare Research & Quality, nearly 9% of the U.S. population is at risk for an adverse event because of language barriers. According to a 2014 article in ‘Modern Healthcare’ magazine, when interpreter services are available in healthcare facilities, they surprisingly go unused – this can have devastating consequences. Millions of dollars in damages and settlements are paid out every year for malpractice cases where the provider failed to utilize a professional interpreter or interpretation service. And this isn’t just a big-city problem. With the largest rate of increase of LEP patients in our country happening in rural areas, facilities in every part of country are realizing the need for solution that is simple, easily accessible, and reliable. Eloquence Communications, Inc. has created just the solution health organizations need, a multilingual patient provider communication solution. This comprehensive tool empowers all those affected by removing barriers to translation/interpretation for patients, caregivers, and healthcare facilities on a cost effective, 24-7-365 basis by providing patients immediate communication access via a touchscreen tablet device displaying 30 of the most common requests in their native language. 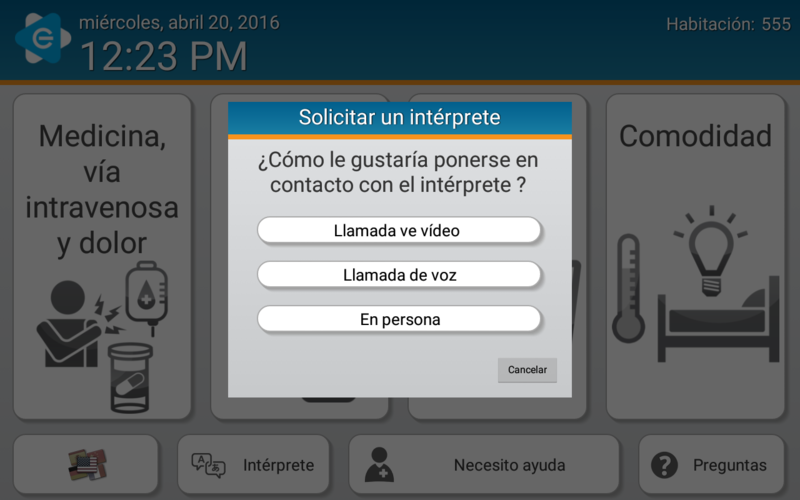 From this tablet, a patient’s request is routed to the appropriate caregiver on their mobile device, the nurse or aide acknowledges the request, and a confirmation is sent back to the patient – in their preferred language. Equally as valuable is Eloquence's feature that allows the patient to immediately speak with a live interpreter by simply touching an icon on the device. For hospitals and healthcare facilities, LAS is customizable, intuitive, requires no capital expense, and its WIFI connectivity makes installation a simple plug-and-play solution, avoiding any disruption to patient care. Eloquence Communications, a healthcare IT company founded by Dr. Lance Patak and Dr. Bryan Traughber, is dedicated to improving the delivery of care through the development of innovative and simple communication solutions. Drs. Patak and Traughber have committed themselves to helping healthcare facilities achieve optimal staffing allocation and workflow efficiency while driving improvements in patient communication, safety, outcomes, and satisfaction, in an impactful way.